In a surprise twist, Facebook has reversed its rules on cryptocurrency-based ads. Facebook implemented the original rule in January 2018 to ban advertisements for cryptocurrencies and other potentially harmful financial products such as binary options. The policy was put in place to stop or limit advertisements that they consider misleading or deceptive. The policy change was intentionally broad in an attempt to protect Facebook users. The original change to block all cryptocurrency advertisements on the platform came as a knee-jerk reaction to what some would call an avalanche of “scammy” ICOs using the site to fund their upcoming projects. Projects that utilized advertisements over technical innovation were generally considered cash grabs or high risk to many veterans of the cryptocurrency market. Unfortunately, legitimate projects were also censored from the platform because of these policies. Now that the market has settled down, Facebook has reevaluated its policy concerning cryptocurrencies and will allow projects to advertise as long as they pass an initial application process. To determine eligibility applicants must provide background information on their company or project. 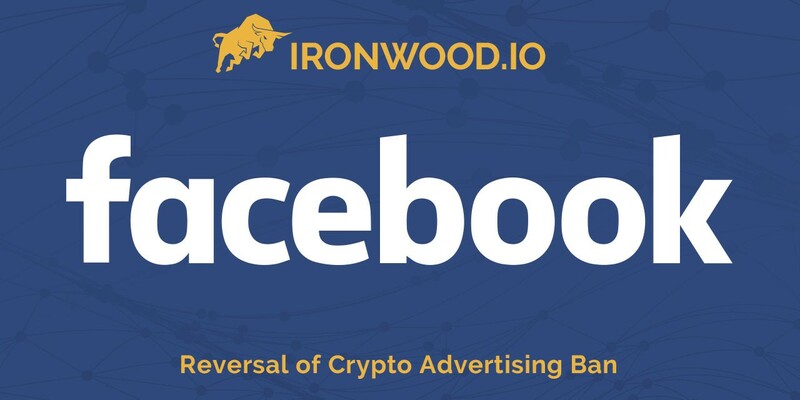 The information required includes any regulatory licenses, whether the company is traded on public stock exchanges and to agree to the Facebook Cryptocurrency Ads Addendum. Starting June 26th, pre-approved advertisers will be able to use the advertisement platform once again. Projects or companies that are considered possibly deceptive or predatory, such as binary options or ICOs, will continue to be banned from the platform. Moving forward, Facebook states that they are open to modifying the policy based on feedback from the community. It is unclear if there will be a change to that policy in the future regarding initial coin offerings. Facebook changing its policy towards cryptocurrency continues a trend of legitimization for the industry, as seen throughout media and through the recent SEC ruling on Ethereum. Rumors say Facebook is considering creating its own cryptocurrency, which would possibly influence the decision to allow crypto ads on its platform. Facebook has come under scrutiny for its third-party sharing of data with Cambridge Analytica, where it was revealed that up to 87 million users’ personal data was improperly shared with the company. Facebook went into full damage control mode with its own ad campaign, and cryptocurrencies may have been swept up in an attempt to appear as though the company has its users’ best interest as a priority. As an advertising platform, Facebook is the cutting edge of consumer engagement and has a large audience. Increased media coverage of the crypto industry likely won’t have an effect on current enthusiasts who already know where to find relevant information, but it could attract new investors. An influx of new investors brings with it new capital into the market. The return of cryptocurrency ads to the Facebook platform could be a catalyst for the next market bull-run.